Keith Szarabajka jumped in last issue. Campion was a great experience for me. I was a frustrated, very small athlete and always wanted to letter but was too small for football or basketball. My father had died when I was very small and my mom decided I needed some discipline and organization in my life so she convinced her big brother to pay my way to Campion. It turned out to be the best thing that ever happened to me. I met a lot of great folks who all had a role in forming me. Lucky for me, the wrestling team started our junior year and I finally had my sport... something that was competed by weight class. Cliff Crestodina, one of my classmates and our best wrestler wiped me around the mat a fair amount and taught me a lot about wrestling. We had a great camaraderie with exceptional leadership from Coach Campbell. I was a 112 pound wrestler and rarely had to worry about weigh-in junior year. We had a winning team right from the get go. As senior year rolled around I knew my uncle was not going to be able to foot the bill for college so it was scholarship or live at home. John Sevier told me all about the Naval Academy and how he wanted to go there. Sounded like a good idea at the time. Free college and I was sure those uniforms would be a chick magnet. The idea that I would actually have to go into the Navy after college never really crossed my mine. My SAT scores were high and I was of interest to the wrestling coach at Navy. I applied and passed the physicals and the wait was on to see if I was admitted. My mom was not going to let me put all my eggs in one basket so I was applying to Lehigh U. (another wrestling power), John Carroll University, Notre Dame and for an ROTC scholarship which could be to a number of different schools depending on how well I did on exam. The ROTC scholarship exam was in La Crosse so I got to take the train up in the fall of our senior year, stay in a hotel with a couple other guys, take the exam on Saturday morning, then come back to PdC. Unfortunately, it turned out to be Oktoberfest weekend and you could drink on every street corner in La Crosse. That night was my first hangover. I puked my way through the exam the next day. I am sure the proctor thought I had answers hidden in the bathroom. Needless to say I was not very confident ROTC was in my future. Three months later I found out I had gotten scholarships to Tulane and Notre Dame. That was great for tuition but I would have to pay room and board and that was not in the cards at ND. I also got a scholarship to John Carroll which looked most promising. Then out of nowhere came an appointment to the Naval Academy (USNA). Good news; bad news. I got in but I had to be there 29 days after graduation from Campion. At graduation Father Lucey pulled my Mom aside and told her that I was too wild to make it at Navy... nearly broke her heart. I was determined to prove him wrong. I traveled back to PdC after Academy graduation just to rub it in his face. My first airplane flight in June of 66 took me off to Annapolis. I was a runner and in good shape so the pressure at the Academy was not particularly challenging that summer. After Jebbies, I thought USNA was pretty easy. There were plenty of guys who were not very good at having people haze them and yell at them which took the spotlight off the rest of us. 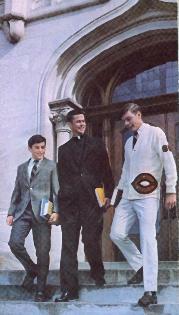 Once the academic year started I found physics was a little different that our time with Father Scott. Academically I was not a star, but I did well in everything else. I made the freshman wrestling team and had a decent year, mainly because the number one recruit in my weight class left at the end of the summer. Sophomore year I was struggling academically and a new plebe showed up (who went on to be an Olympic Champion) and I knew my wrestling days were over. So I left the team. I had never seen an ocean until after my Plebe year at the Academy. I was amazed at the marvels of steam and the engineering that drove the ships thru the seas. The next three years at Navy went by rather quickly. I was also enchanted with the young sailors who labored in less than ideal situations to serve their country. I thought about quitting after my sophomore year which was our last chance to do so before being obligated to the fleet. Again it would have broken my Mom's heart, and would have proved Fr. Lucey right, so I persevered. As graduation approached I was losing my appreciation for some of the officers who served at USNA as mean heartless guys, so I was thinking the Marine Corps was in my future. I did not like flying and could not imagine a life where I had to fly every day. Plus your obligation in aviation added a couple years to your time in the Navy. Vietnam was in full force in 69/70 when I was a senior and something told me to stay Navy so I selected surface ships. My first CO was a great guy who convinced me to go to Department Head School early. Since it would add no obligated service I thought why not. I still play golf every Saturday with that first CO. My first ship was a minesweeper and the CO was a Lieutenant... so only a few years older than me. He made every day a kick and gave me great responsibility. We got shot at in Vietnam but it never seemed real and never seemed like danger was close. That CO attended every change of command I had througout my career and I always teased him and he loved every minute of it. I went thru a series of assignments afloat and ashore and always told my wife I was getting out after this tour or that tour. Then the Navy would offer me just the right job and I would stay. I served as administrative assistant to the Secretary of the Navy, two of them actually, John Lehman and Jim Webb. I learned a lot and went on to command a destroyer. I was on deployment and had written up my resignation. I had 20 years in and was ready to go make some money. Then I got selected for early promotion and Desert Storm started and it just did not seem right to leave. I had a major command and went on to serve as executive assistant to the CNO (the senior uniformed guy in the Navy). Unfortunately he committed suicide while I worked for him. One week to the day after, I was selected for my first star. I got to meet Presidents Clinton and Bush 1 and a lot of other luminaries. During Desert Storm I was the daily operational briefer for SECDEF... a guy named Cheney. I spent a lot of time with the Chairman... a wonderful leader named Colin Powell. I went on to command a Battle Group which is an Aircraft Carrier and ten Ships and Subs that make up the principal fighting force of the Navy. Great Experience! ...George Wendt '66 came to my change of command on the carrier and I was a rock star for knowing "Norm". My last assignment was in San Diego as commander of all Surface Ships in the Navy. I held the job for 4 years... longest anyone ever held it. My wife finally had had enough and we retired after 35 years and 17 cross country moves. We settled in Coronado and life is pretty great. On March 31, 1975, the student body learned of the impending closing of Campion. When I think back to that period, certain events happened that are now milestones in my memory. We had all just returned to campus from spring break. My first class on Monday, at 8:00 a.m., was Sophomore Latin, and Fr. Wendel Langley S.J. began his lecture by stating "You are going to be hearing talk about the school closing..." He then went on to give a very memorable speech about how institutions like Campion were established and grew, based upon the commitment and sacrifice of many people over the years, and what had happened in the intervening time period leading up until that day. The room was dead quiet as I believe everyone was stunned into silence. The remaining weeks until the final graduation were filled, it seemed, with intense and bewildering events stemming from the fait accompli. Now, there had been rumors circulating among my classmates of Campion closing that actually began after the announcement of President Gregory Lucey's heart attack in September of 1974. But, for me at least, what made this hearsay transform from just rumor to rumblings beneath the surface was what a classmate told me before we left for spring break. Bear in mind that this was not a firsthand experience I could relate, only second hand information that couldn't be confirmed back then. So readers can take it for what its worth. But somehow, he learned of a high level meeting that took place earlier in the semester, chaired by Fr. Lucey. As my classmate explained, at that meeting something very important was discussed with all in attendance. And at some point, based upon what was said, Fr. John Scott wept openly. This startled me. Was this the meeting, as Fr. Lucey himself related in Jesuit Journeys ten years ago, at which he told faculty of the decision to close? Who knows. If so, it must have been very hard on him ,and others, to remain stoic and professional until May. The remaining weeks until graduation seemed to supercharge events and everyone with passionate debates, intense exchanges and much hand wringing. We were told that if we were going to go, then we should go out with a shout. So...until the announcement, it seemed that there wasn't even enough interest in forming a track & field team. Suddenly, there was an enthusiastic throng of students at track & field tryouts and practice. And there was heightened interest in all other remaining school activities scheduled in April & May, as the student body rose from lethargy to action. Every day now seemed to concentrate peoples focus on what was important to accomplish with our time left and what wasn't. The Mothers' Day weekend of May 2-4 would normally be devoted to welcoming visiting families with a play or concert. Instead, it became an open house for recruiters visiting from other schools, as students from the classes of 1976-77-78, along with their parents, scrambled to make arrangements for completing their educations elsewhere. There was some attempt to assuage the shell-shocked through a kind of sympathetic understanding of what closing meant. I particularly remember a meeting in Our Lady of Angels chapel. Fr. Lucy attended as well as a large number of students. It seemed something like a combination prayer service, discussion, counseling session and time for reflection. The problem was the impending close, hanging over everyone, gave it some of the feeling of a wake for a lost friend. There was one piece of recorded music that played in which the noticeable lyrics "One more year...one more year" were sung. I guess if that piece was chosen by members of the class of 1976, they could be cut some slack for their bewilderment. For here they were... with one year left to go, on the cusp of making application for colleges, everything for which they worked for the preceding three years, and now it was all being upended. They faced completing their remaining year at an alien school that knew nothing of their accomplishments, academically or otherwise. I'm not sure the prayer service helped much. The final week of school, wrapping-up with final exams, seemed to be filled with ethereal goodbyes. As families arrived to pack up our belongings and head home, many said "we'll see each other again, sometime." But a detached knot within told us that there were those whom we would likely never see again. Those are just some of the main points that come to mind if I were asked to describe the events following the announcement of Campion's closing. It should be said that the faculty and administrative staff did as much as they could to make the best of the situation by helping students make the transition to another school and going the extra mile in that effort. They did as much as they could to end that academic year on a high note. And their efforts did not just end in May of 1975, but continued via providing referrals and recommendation letters for college applications, and not limited to just that. I know this for a fact because I was done a huge favor by one of Jesuits who taught me. To this day, he probably does not know just how significant it was. Now forty years on, Campion may be gone. But it will continue to cast a long shadow in our lives. After so many years I've lost much of the details that surrounded the last couple of months at Campion, but one memory stands out loud and clear. It was the very last night at Campion. All the students were leaving the next day. The air was thick with sadness and profound regret...regret for not being able to spend one more year at Campion. I and a very good buddy were laying on our backs, in the practice field just west of Xavier Hall trying to soak up every last bit of what was to be lost forever. We reminisced about the previous three years, We talked about how we would stay connected in future years. We complained about how such a great injustice could be done to us. So many unanswered questions! I can remember quiet tears of disillusion winding their way done my cheeks. Then, when every last bit of emotion was drained from us, when we voiced every last complaint (and maybe twice) we got up, when to our rooms and closed a chapter in our lives. In that monumental moment, Campion gave us one last, great lesson... how to accept and handle profound disappointment. Being at Campion was a tremendous experience all things considered. I know all students didn't walk away with the same positive experience I did. That's just the way life is. For me, however, it ranks pretty high. I don't remember the announcement in class that Campion was closing, but I do remember walking from classes, across the quad to Xavier hall experiencing my first "pink slip" moments, i.e. when an institution I was part of, gave notice that they were about to let me (and everyone else) go. I remember our long rush after in the '76 class trying to pile-on and pack-in classes sufficient to graduate a year early, and then many of us, including me, finding out in late April 1975 that even with doubled up classes we had to put in another year. So by May it looked like I'd have to either #1. Go back to where my dad was working in Bolivia and finish there (maybe going on to study tin mining, petroleum engineering, cotton or cocaine cultivation), or #2. Apply in Wisconsin courts to release me to custody of my adult sister in Wisconsin (which we did with my parents consent). Bolivia didn't fit with my long term plan of becoming a rock star (hey - I was 17), so the answer was #2; But, staying in Wisconsin to finish was complicated by the fact that I had a Jesuit school transcript, and the public schools had different requirements - So, I ended up moving to Madison at 17, getting my own apartment, and finishing up at Edgewood Catholic HS in 1976. Overall it was a good learning experience. I learned that success is determined more by the student (employee), than the institution (company). Companies come and go, but networks, like the Campion Forever network, persist. Received word by way of a first class letter sent out by from Fr. Lucey to alumni in early April 1975 - I remember the postage meter post mark on the envelope, containing the line "The Quest Of The Century 1880 - 1980". That post mark had been in use for about five years. I have nothing but fond memories! I wish I could have sent my Boys to Campion. They're grown men now and still have no clue!! I left Campion ready and willing to take on the world. Was it our generation, or, was it Campion?? I can add some thoughts. One, this announcement to the Jesuit Community was made on Good Friday of Holy Week. A deep silence followed, not of shock exactly, but of taking in the magnitude of the announcement for us, for staff and for students especially in the three lower grades. Bro Staber and Fr. John Scott began weeping. After more silence the Provincial Fr. Pat Burns asked if there were questions and there were many as you can expect. All things done under God have some immediate positive quality. Relief was the Jesuit reaction to know definitively one way or the other. Long range, Campion was sold and the money put into a trust for support of Jesuit secondary schools in our Province. The biggest single recipient year after year was Holy Rosary Mission school Rose Bud School which had the fewest resources from students and grads. The Rose Bud is the most successful Indian school in the state of South Dakota, in graduating its students. P.S. at Jesuit Retirement Center in the St. Camillus Complex in Wauwatosa, there are 15 men who either graduated from Campion as students or worked as teachers. My four years at Campion involved so much more than schooling. It marked a period of personal growth, interaction with other students and adults, opportunities to pursue extra-curricular activities and surviving away from home. The years passed quickly and in the spring of 1975 I waited for the last few weeks to fall off the calendar as the realization of graduation approached. It was a busy time with classes winding down, finalizing decisions for college, trying to figure out how things would be without Campion and how we'd all stay in touch. I had come to love it there. When the announcement was made a wide range of emotions came out. I felt lucky I'd be in the last class to graduate. I wondered what would happen to friends who were underclassmen. Where were my teachers going to end up? Could we come back to campus at all and relive some of our experiences? At the age of 18 such decisions can be devastating. I felt lost. It took much of the joy out of my final few weeks. For me the year ran the gamut of highs and lows. I was selected as an RA in Lucey Hall, on a wing of sophomores. Adjusting to the supervisory role and not living with my peers from the previous three years took some time. While I wasn't required to have a room mate, I opted to invite a friend from my hometown to join me at the end of the hall. It only lasted a few months as he was kicked out of school at Christmas for violating school policy. Another friend who played football suffered a brain aneurysm at a game in Marshfield and was hospitalized for 16 weeks. He eventually returned to school in January and I was asked to share my space with him. His brother, a sophomore, lived two doors down and we'd keep an eye on things. After about five weeks my roomie spent more time holding court at night with underclassmen and little time studying and respecting my wishes for a little quiet time. Unfortunately his injury had drastically changed his behavior and soon he headed for the Senior floor in Xavier Hall. It was quiet having my own room but still I struggled with the isolation from my fellow seniors. I spent much of the late evening hours those last couple of months in my prefect's office reminiscing and discussing the decision to close the school. The issues of dollars and cents made little sense to all of us. Wasn't there a way to keep it going? It felt like all of us gave up on something that had given so much back. How could this be happening? The primary reason the closing of Campion hit me so hard was due to the fact that during a forty-eight month high school tenure, roughly thirty-six of those months were spent on campus in PdC. It became home. Summer vacation was just that -- a summer spent on vacation away from a place that had taken the place of home. Sure, I realized after four years I'd be moving on to bigger and hopefully better things but sometimes there is a hesitancy in walking away. You'd like the opportunity to revisit the past, sit down and chat with former teachers about the antics you pulled during your time and recall those trips up the bluffs or down the Mississippi. I've returned to Campion three times since that final graduation in '75. The first was with my fiancée on a trip from Chicago up to La Crosse. Those bars down on 3rd and 4th street needed to be patronized now that I was of legal age. The other time involved a trip to visit relatives in Decorah. We came down into the valley into PdC on Highway 18/35 and crossed the river into Iowa. The sign in front of campus still stood although it had been yellowed out. Faint red lettering announcing "Campion Lives!" could be seen near the bottom of the marquee. I didn't stop but a smile flashed across my face as I drove by. About five years ago I attended the Campion golf outing. By then our alma mater had been turned into a detention center (it seemed to serve in that capacity when I was there although the fence and razor wire were absent). The only building left open was Hoffman Hall. A boys AAU hoops event was being held in the gym so I decided to check things out. The building, now a part of the PdC park district, showed it's age. The snack bar was an empty room. The pool had been drained and was littered with old plaster and debris. Inside the locker room several banks of lockers had disappeared. The wrestling room sat vacant. I ambled throughout the lower level looking for a souvenir. There were none to be had. The only remnant of a Campion Knight was affixed to the wall in the pool -- a signboard with the pool records. I made out the names of Dave Barlow and Mark Bodnar -- that was all that remained. I left the gym with way too many memories flooding my mind. The late afternoon sun reflected off Lucey Hall bouncing off the twelve foot security fence topped with razor wire. There was no visible activity in the quad. The place sat eerily quiet. It was as if I had never attended school there. The place I was looking at was the furthest thing from my mind back in 1975. I haven't been back since. The young men that walked onto campus and spent a week, a year or two, maybe even stuck it out and graduated hold memories of a special place with a unique mix of individuals in time. A high school you ask? Oh no, so much more than that. It transcended any educational experience imaginable. The decision to close affected all of those who studied, taught and worked at Campion. Forty years ago? It can't be that long. I spent a four year lifetime there; one I'll never be able to revisit but one I will never forget. If you can't wait until October for closure! Of course, for those of us who attended the standard reunions for 10-15-20-25 etc. years from graduation, we already had a clue as far back as 1973. I know that when we were at that unforgettable reunion, Fr. Gregory Lucey, President of Campion at that time, spoke to us at a meeting in the dining hall, indicating that the future for the school was not bright. In 1975, I learned of the actual closing in conversation with other family members at my sister's house, because a brief article had appeared in a newspaper. There was a news release, but it was not covered in every media outlet. I think it was in a diocesan newspaper, as Catholic media were more likely to cover such a story. I recall getting the news in April, and I immediately planned to go to Prairie du Chien to see what had been going on. On Sunday afternoon, I got into a conversation with Fr. Lucey. We were in his office and he explained in some detail about the financial bind that had developed over the past several years. He also outlined his plan to help establish a Campion Alumni Association, and invited me to a meeting that was held at the Chicago Yacht Club later in the summer. After that, I wrote a letter to my classmates. I think I could find a copy of that letter if I had more time to look. There were three focal points to my work with CAA in those early years of its existence. I accepted a shipment of three skids, containing boxes of Campion stuff, including athletic trophys, books and old publications, and probably some other stuff that I don't recall. A few years later, when we sold the company and the real estate, arrangements were made to have most of that Campion stuff picked up by an archivist from the Marquette University Library. In 1979, I contacted class representatives from the various reunion classes (1969, 1959, 1949, etc.). Several of those classes chose to participate and so we had a multi-class reunion at the Ramada O'Hare Inn. There was a golf outing as part of the reunion program. That reunion had to be considered a success, so we did it again in 1980. The participation was a little less, but still it was a success. Participation dipped noticably in 1981, and so I did not try to do it again in 1982. The third aspect of my participation was in publishing an alumni edition of the Campionette. This was primarily a method of getting the word out about the reunions in 1979 through 1981. After 1982, CAA did not keep up the same level of activity, though the golf outing has been continued by a group of golf enthusiasts from among our alumni. In answer to your question about the reaction of alumni, I can tell you that I had the opportunity to listen to many alumni at those reunions, in lengthy conversations in the hospitality suite we had rented. Most of that reaction was highly critical of the Jesuits and the changes that were enacted at Campion in Fall 1966 and in later years. Some of the criticism was calmly expressed and then again, some alumni appeared to be more than a little angry about what the Jesuits had done. I don't think anybody was really happy to know that the school was closed. Those who had calm reactions simply expressed the idea that there is a new reality in our society, and that there might not be room in American society for a school like Campion in the future. Those with a more angry reaction felt that there should have been more resistance to the deterioration of society's standards. There are a lot of issues, which could be listed here, but for brevity, I will skip that. It remains an open, unsolved question: Did the closing of Campion represent a case of this Campion community simply following the downhill trend, or did the Jesuits at Campion, (or the Jesuits in general) by their failure to maintain the traditionally high standards, actually lead the downhill trend?